Pork cheeks in red wine sauce. Do porks even have cheeks big enough to make a dish? That was my first thought as I scanned the menu. However, brave curiosity is sometimes the only way to amaze oneself. Fennel salad, Italian cold cuts, ricotta-pear ravioli, pork cheeks in barolo sauce. Yes, this was a good decision. I came across Riviera Enoteca da Cucina by accident while I was looking for another restaurant. Moved by the simplicity of its menu and the warm atmosphere of its greenish walls, I hurried to reserve. As we stepped in from the cold, the welcoming came from different voices, female, male, cook, waitress. They want to make you feel welcomed and I like that. The bread is typically Italian (little salt, soft center) and the wine list provides a selection that allows for humble to special nights to fit the mood. The food is comforting, but fresh. The pig’s cheeks, one of the house specialties is not only cooked to buttery perfection, but also allows for an out of the box experience to anyone not used to such a meal. 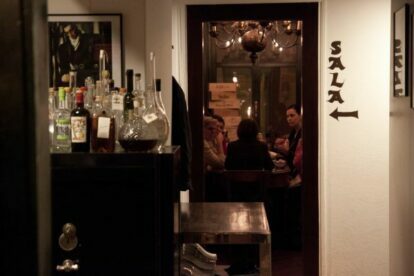 What is also interesting is that there is an Enoteca, where one can enjoy a bottle of wine market price or you can also bring your own to the restaurant for an extra. I could not say that this is a good option – as I did not try it myself – but the flexibility of their ways, it’s worth a mention.